In 2012, Google launched a tool called the Knowledge Graph to provide searchers with faster, more relevant and more comprehensive results. The Knowledge Graph pulls information from a wide range of credible sources across the web to create an immediate, thorough and accurate result as quickly as possible. Google is building the largest knowledge database that exists to create a Knowledge Graph for essentially any search topic. With this search engine optimization (SEO) trend gaining traction in 2018, make sure your brand knows what this tool means for your SEO efforts. 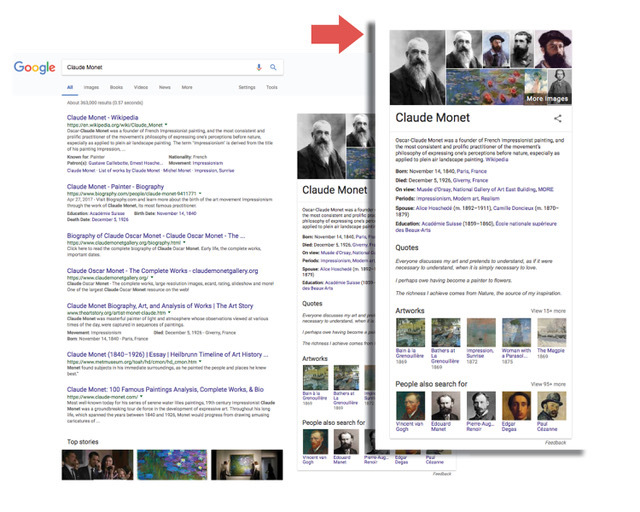 The Knowledge Graph appears in a display box to the right of search results or on the top of the results page for the most visible and universally accessible information on the web. Since the Knowledge Graph automatically has the highest visibility on a search engine results page (SERP), searchers no longer have to click on website pages to find the answer to their search inquiries. This new display format on SERPs gives the Google Knowledge Graph the highest position in every search and has a direct impact on search traffic to websites. If a searcher finds the correct results without clicking on specific website pages, this decreases the number of clicks website pages get for specifically branded keywords. With the rise of Google’s Knowledge Graph, skilled implementation of semantic search is more valuable now than ever. The Google Knowledge Graph uses semantic search to interpret and understand the content on a wider range of website pages to generate a display box of the most relevant and accurate results. To make sure your brand’s website pages rank, your SEO team needs to optimize for specific on-brand topics instead of branded keywords to increase the chances of your website page appearing in the top three results for specific searches. If brands want to continue to rank and maintain top visibility, they have to be willing to work with the trends that are changing the way content is appearing on SERPs. Take advantage of Google’s Knowledge Graph by utilizing the major platforms that contribute to it. For instance, create a Wikipedia page for your brand if you haven’t already to supply the Knowledge Graph with relevant information for specific topic searches. Be sure to use schema markup on your website, so that search engines read and understand the context of your website pages to increase your website rankings and deliver more accurate results to searchers. The Google Knowledge Graph is impacting the information that shows up on SERPs and changing the way your website pages are appearing to your targeted audience. Your brand needs a team of SEO experts that know and understand how to optimize website pages so that your brand gains more visibility and contributes to the Knowledge Graph for specific topic searches. Rivers Agency is a full-service team of trained SEO experts who have the talent to work with the Google Knowledge Graph and bring your website top visibility. Let’s talk!